areas not previously accessed. 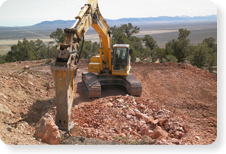 Careful attention is given to minimize disturbance and provide safe access. Compliance to all company and agency environmental concerns is a priority. Drill Pads - Level, safe surface areas are provided for drilling and support equipment. Pads are designed specifically to the size and type of equipment used in each location. Sumps - Water and drilling by-products are required to be contained. Sumps are provided for this runoff. Haulage - Some jobs require additional materials to be moved. In these situations, the use of trucks with belly dumps or rock trucks may be used. Road Cleanup - Roads are kept travel ready as needed. 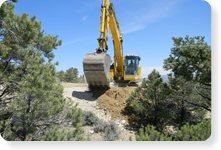 Motor graders and rollers are used as the situation requires. Dust Control - Water trucks are used where dust control is needed. Water trucks are also used to provide water to various drilling operations. Towable water trailers are also used in summer months for fire watch while walking equipment. Proper Drainage - Culverts may be installed in certain areas for proper road drainage. 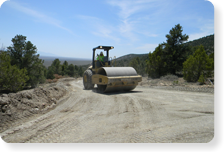 Roads are built for safety, but also built in compliance to any regulating agencies. Snow Removal - Many times projects will extend into winter season. Various sizes or types of machinery are used to keep roads open. 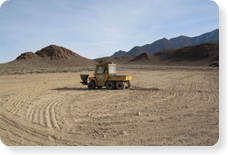 Reclamation - Some sites must return to their natural state if no resources are found. From the smallest access road to large haul roads may be reclaimed. Returning the area to as close to its original shape as possible is the goal and the machinery used is determined by the particular site. Reseeding or Revegetation - To complete the "return to nature" reseeding needs to be done. Some areas may require hand seeding and others may require some use of equipment. All reseeding is done in compliance with the associated agencies.